Willy O'Callaghan recognised for 60 years of Shepparton swimming - Aquamoves – Indoor and outdoor pools, fitness facilities and programs in Shepparton, Victoria. Willy O’Callaghan has prepared a hand-written list of swimmers she has worked with that have gone on to great things. This is no brag-chart — the list has been compiled to help organisers of a Diamond Jubilee celebration of her decades of dedication to Shepparton swimmers. She reels off some names — Amy Young, Alicia Royden, Kate Church, Elise Mulcahy, Jake McKenna, Tom Houston, Carter and Brennan Swift — but she gets sidetracked with memories. The list is several pages long — and you know she won’t get to the end. But there’s one name not on the list that she talks about with just as much passion as all the rest. ‘‘There’s also kids like Gayle Bonnette. She worked hard, but she was never going to be a great swimmer. But now, later in life she really stands out,’’ O’Callaghan said. She goes on to recount how Bonnette coached at Victorian state level and opened a swim school in Essendon and married a Balinese man. But O’Callaghan is even more impressed by Bonnette’s achievements outside swimming. ‘‘She was doing youth work through her church with street kids and they went to Bali and now she’s a pastor in the the church up to her eyeballs in youth work,’’ she said. All this says two things about the diminutive 71-year-old grandmother. Firstly she’s old school — there’s no email messages or computer statistics. She hand writes all her instructions and prefers face-to-face contact. Secondly — it’s the person inside the swimmer that O’Callaghan is interested in. ‘‘After coaching for 50 years you learn a lot about what works and what doesn’t — particularly with individuals,’’ she said. ‘‘What suits John, doesn’t suit Paul. O’Callaghan arrived in Australia from Holland as four-year-old Wilhelmina in 1952 — and she can still speak fluent Dutch. She joined Shepparton Swimming Club as an 11-year-old when a physiotherapist recommended swimming to help with shoulder problems. A year later she was competing in her first Victorian country swimming championship at Bendigo as a 12 or 13-year-old . She coached at the event for the first time in 1969. From then until she retired as head coach at Shepparton Swimming Club in 2016 she can’t remember ever missing a ‘‘countries’’. She also formed her own swimming squad called Willy’s Wagtails which competed with Shepparton Swimming Club. 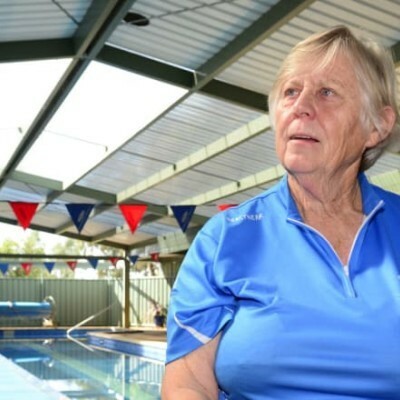 Later on, she ruffled feathers when she swam for a Shepparton Lifesaving Club award and was told she couldn’t because she was a member of Shepparton Swimming Club. ‘‘That was a challenge and challenges are not really things I like to walk away from. I said if I get this distinction award for lifesaving I would join the Shepparton Lifesaving Club — and that’s exactly what I did,’’ she said. She also went on to become an Australian Masters coach — something she still does. O’Callaghan took up another big challenge in the late ’90s when she tried to obtain a monofin for champion butterflyer Elisha Fiddes. ‘‘I saw it in a magazine from America — but I had no idea where to start,’’ she said. After several phone calls she got a contact from a Tasmanian sports store — but the phone number was for a Russian sports store. When a big box arrived at her Shepparton home with a Russian postmark, O’Callaghan became the first Victorian swim coach to import a monofin for her swimmers. ‘‘Butterfly comes from the chest — so when you have a monofin on, if you don’t push from the chest you can’t get the kick going. You have to be very strong. It gave me a lot of understanding about breaststroke,’’ she says. A highlight of O’Callaghan’s coaching career was the four years she spent bringing Kate Church to the 2000 Sydney Paralympics. ‘‘Kate was doing 11 two-hour sessions a week at the last couple of years to get to that level. She put in a huge thing — and we went to the 50m indoor pool in Echuca in the winter,’’ O’Callaghan said. The work paid off when Kate made it into the Australian team and the pair travelled to Sydney in 2000. Not being part of the national team, O’Callaghan was not allowed poolside, and illness prevented Church’s medal hopes. ‘‘She was there and she did her best. She put in a huge thing and we both found out a lot of things. I had four years to teach her the stroke and she did very well,’’ O’Callaghan said. 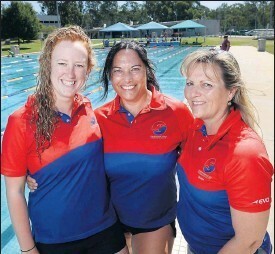 Today, coaching at Shepparton Swimming Club is new hands with Michelle Swift stepping in after O’Callaghan’s retirement. ‘‘I’ve got a lot faith in her, and I’m very happy to leave it with her,’ O’Callaghan said. Daughter Tara Kalms, also a swimmer, says her mother’s patience and quiet determination has helped steer generations of youngsters towards their personal goals. ‘‘She’s more than happy to adapt to people’s different needs. She can teach people to just stay afloat if that’s what they want — or she can take people right up to competitive level. ‘‘Her style is not about yelling or pushing — she just asks ‘do you really want it?’,’’ Kalms said. Paralympian swimmer and inaugural Shepparton Sports Hall of Fame inductee Kate Church said it was Willy O’Callaghan’s relentless commitment that took her all the way to the 2000 Paralympics and to a world record and national record which she still holds. ‘‘She totally changed my life,’’ Church said. The Mooroopna swimming champ said she trained with O’Callaghan for four years before the 2000 Games — putting in a gruelling six hours a day six days a week, including a weekly trip to Echuca’s 50m Olympic size pool. ‘‘Willy saw potential in me to try butterfly and breaststroke — neither stroke I had worked on much before,’’ Church said. She described O’Callaghan as a ‘‘powerhouse’’ who still has a strong motivating affect on her even if it’s 20 years since the pair went to Sydney for the Games. ‘‘She still scares me on the phone because I think I’m not training enough,’’ Church said with a laugh. Church said O’Callaghan’s pragmatic approach was legendary. She said O’Callaghan’s style could be sweet and sticky. ‘‘She used to bribe us with fun-size Snickers bars. We could have gone out and bought our own — but did our absolute best to get one of hers,’’ she said. As well as a world and national record, Church has an impressive medal tally — 13 golds at state competitions, 18 at national level and five silvers at international competitions. She puts it all down to O’Callaghan’s coaching. ‘‘Anything that happened was because of her. She’s such an incredible woman — she’s a hard woman to say no to,’’ Church said. 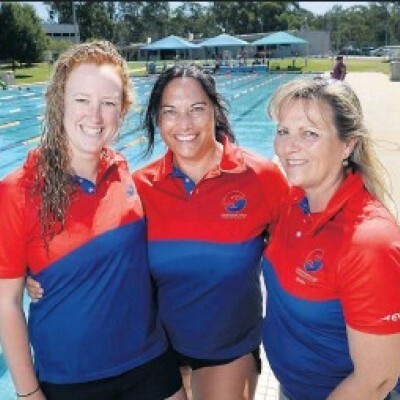 Michelle Swift has taken on the mighty task of filling Willy O’Callaghan’s shoes as head coach at Shepparton Swimming Club — and she reckons she’s building on solid foundations. ‘‘Shepparton is very lucky to have kept her all these years. She certainly had the skills to go much further,’’ Swift said. Swift met O’Callaghan when she arrived with her family 11 years ago from New Zealand. Swift had already done some swim coaching, which was enough to get her in O’Callaghan’s good books. ‘‘I wanted to get my kids involved in the community and booked lessons with Willy. She’s very professional, and she’s so good with kids. She may be small, but they know there’s no mucking around with her,’’ Swift said. Her three boys have since gone on to compete at a state and national level — with her son Carter competing for New Zealand and scoring a swimming scholarship at Eastern Michigan University in the US in 2016. ‘‘All my boys have been coached by Willy — she’s taken them right through,’’ Swift said. ‘‘She’s a technique wizard — she’s one of the best in Victoria. She can look at any kid and pull apart their stroke and build it up again. Shepparton policeman Glenn Gibson reckons Willy O’Callaghan’s contribution to the Shepparton sporting community — as big as that may be — goes beyond swimming. ‘‘When you think of the number of young people she has been involved with over the years — it must be in the thousands,’’ the Leading Senior Constable said. He said O’Callaghan’s contribution had been as much about social work as sport. ‘‘She’s given young people structure in their lives — you’ve got to be organised to swim. Getting up early to train before school — she gets them organised,’’ Gibson said. The father of two said he first took his children along for swimming lessons with O’Callaghan at Aquamoves in 2005 — and the family has never looked back. He is now president of the GV Crocs, the Shepparton branch of Masters Swimming Clubs — which O’Callaghan still coaches, while his son and daughter still compete in open water swimming events. He said O’Callaghan defied the stereotype of the bullying, hard-nosed coach. ‘‘She’s amazingly resilient and patient,’’ he said. 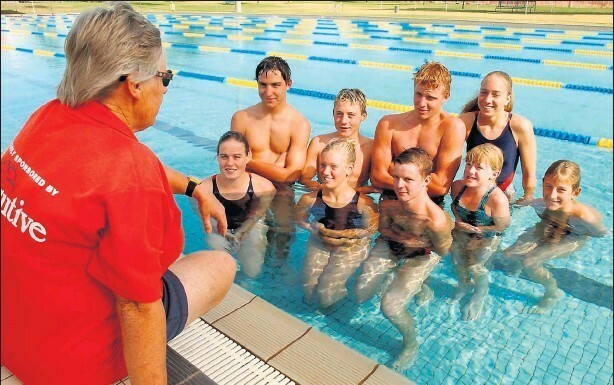 Gibson described O’Callaghan’s contribution to Shepparton Swimming Club as ‘‘the glue that provides the structure’’. ‘‘She’s a country coach who can work with anyone from people who just want to participate, right up to your Kate Churches at elite level. ‘‘She gets pleasure out of everyone’s success. Six decades of Willy O’Callaghan’s involvement with swimming in Shepparton as coach, competitor and colleague will be celebrated with a special Diamond Jubilee event at Emerald Bank’s The Woolshed at Kialla from 6pm on Saturday, April 27. Co-organiser Glenn Gibson said it was a chance for members past and present to catch up, say thanks, reflect and celebrate an incredible era in Shepparton sport. The evening will include a testimonial gift, entertainment and food. Tickets are: Full $65; 13-17 years $50; 12 years and under $30. To book, phone Riverlinks on 58329511. Article from the Shepparton News on Wednesday 3 April 2019. Written by John Lewis.